Sometimes, an idea for a project comes to you in the strangest way, and in most unexpected places. I was doing laundry the other day when a parcel fell out of the cabinet above my washing machine. I picked it up from the floor to discover that it was a package of Lavender Dryer Bags that I'd purchased at Trader Joe's eons ago. I love the scent of lavender, and it's supposed to be helpful to insomniacs like me. I had purchased it with the intent of tossing it in with our bed linens, but obviously totally forgot about it. But just in time to make this lovely Mother's Day sachet for Really Reasonable Ribbon! The process was surprisingly easy. I used a craft pick to poke holes in a lightweight 5x7 envelope, cut open the lavender laundry bag and deposited the lavender buds into the envelope. I sealed the envelope with glue. Next, I lined the back of the envelope with ivory burlap and stitched my designer card stock to the front of the envelope. Instant sachet! 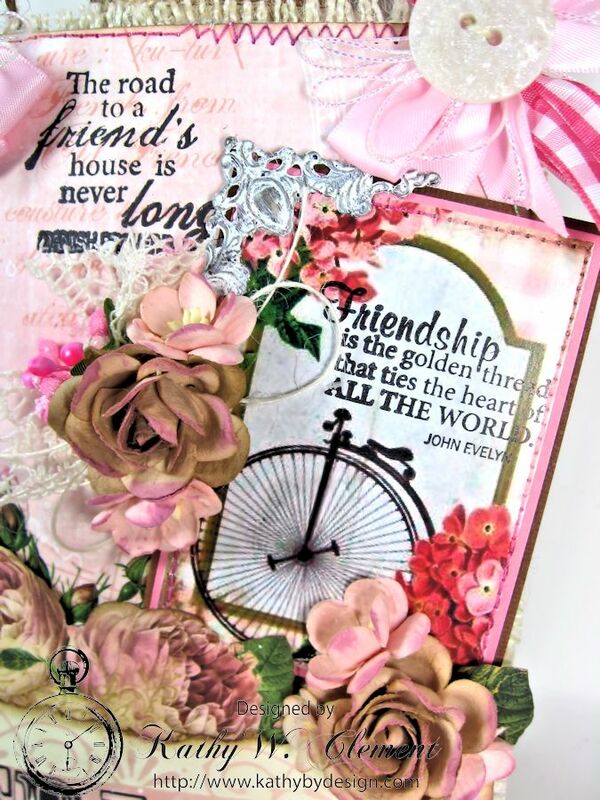 I used one of Polly's Paper Studios pretty Blooming Bicycles Journal Cards to create a card focal by stamping the white space with a sentiment stamp that I found in my stash. Next I layered on pretty Wild Orchid Crafts Trellis Roses and Cherry Blossoms that I tapped with pink ink. I tucked in some pink bead berry sprays just for fun. A shabby bow was tied with ivory burlap string and 1.5" ivory crocheted lace. 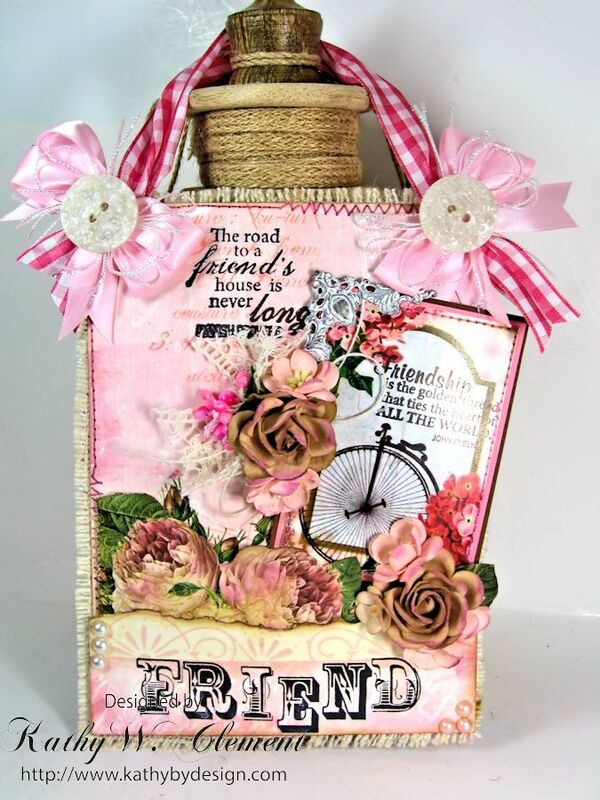 I stamped another sentiment onto the designer paper, and the word FRIEND onto a piece of torn cardstock. The sachet hangs on 1.5" pink plaid ribbon topped with pearl pink satin bows, white iridescent metallic string and vintage pearl buttons. I think this would make a great Mother's Day gift, don't you? 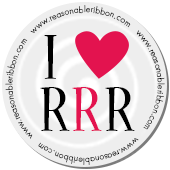 Thanks for stopping by, and don't forget to check out the great Ribbon Club Assortment this month! Absolutely Beautiful Kathy!! And yes perfect for Mothers Day!! Love the colors and all your beautiful details on this!! Oh this is just stunning!! I love the beautiful flowers and papers. 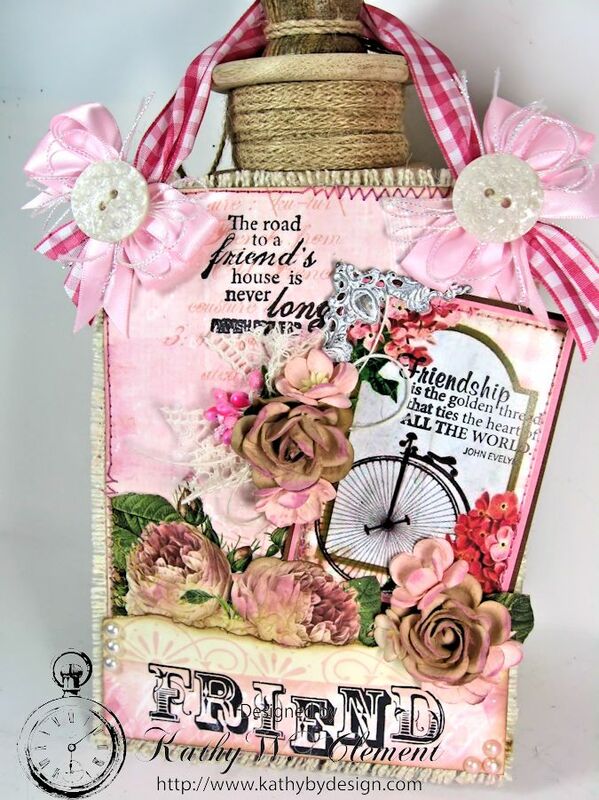 RRR April Blog Hop Winner!